The Clever Hans effect was identified in 1907 by psychologist Oskar Pfungst. He demonstrated that Clever Hans, a horse that was claimed to be able to perform arithmetic and other intellectual tasks, was actually observing the reaction of his human observers. He discovered the effect during research into the validity of the phenomenon, and found that the horse was responding directly to involuntary cues in the body language of the human trainer, who knew the answer to each problem. However, the trainer was entirely unaware that he was providing such cues. During the research, Pfungst discovered that he would produce the cues involuntarily, regardless of whether he wished to exhibit or suppress them. Recognition of this phenomenon has had a large effect on all experiments involving sentient subjects. Clever Hans effects are quite as likely to occur in experiments with humans as with animals. For this reason, care is often taken to make experiments double-blind, meaning that neither the experimenter nor the subject knows what condition the subject is in, and thus what his or her responses are predicted to be. Cuneiform is one of the earliest known forms of written expression. Written on clay tablets by means of a blunt reed for a stylus, cuneiform underwent considerable changes over a period spanning three millennia. Originally, pictograms were either drawn on clay tablets in vertical columns with a pen made from a sharpened reed stylus, or incised in stone. This early style lacked the characteristic wedge shape. Before cuneiform, clay tokens were used count agricultural and manufactured foods. The tokens were placed in hollow clay containers and the lids were marked with the number of tokens inside by pressing them into the lids as many times as the amount of tokens. Later, it was realized that there was no need for both the tokens and the inscription on the containers, so only the inscription was used. Eventually, this system was streamlined with the introduction of symbols for numbers. For example, to avoid making 100 pictures to represent 100 tokens, a dedicated symbol was used. The writing originated as a system of pictographs. The markings became successively more sophisticated, and pictographs developed into conventionalized linear drawings. The pictorial representations became simplified and more abstract. The number of characters in use also grew gradually smaller, from about 1,000 unique characters in the Early Bronze Age to about 400 unique characters in Late Bronze Age. “Elephant in the room” is an English idiom for an obvious truth that is being ignored or goes unaddressed. The idiomatic expression also applies to an obvious problem or risk no one wants to discuss. It is based on the idea that an elephant in a room would be impossible to overlook. Thus, people in the room who pretend the elephant is not there have made a choice. They are choosing to concern themselves with tangential or small and irrelevant issues rather than deal with a larger one. The term refers to a question, problem, solution, or controversial issue that is obvious, but which is ignored by a group of people, generally because it causes embarrassment or is taboo. The idiom can imply a value judgment that the issue ought to be discussed openly, or it can simply be an acknowledgment that the issue is there and not going to go away by itself. The phrase “800 lb gorilla in the room” is a similar idiomatic expression. However, it refers to a large, unstoppable individual or organization that can exert its will as it desires, even if people do their best to ignore it. Numbers stations are shortwave radio stations of uncertain origin. They generally broadcast artificially generated voices reading streams of numbers, words, letters, tunes or Morse code. They are in a wide variety of languages and the voices are usually female, though sometimes male or children’s voices are used. It has been reported that the United States uses numbers stations to communicate encoded information to persons in other countries. Others speculate that some of these stations may be related to illegal drug smuggling operations. According to the notes of The Conet Project, numbers stations have been reported since World War I. They appear and disappear over time, although some follow regular schedules, and their overall activity has increased slightly since the early 1990s. This increase suggests that, as spy-related phenomena, they were not unique to the Cold War. Numbers stations are often given nicknames by enthusiasts, often reflecting some distinctive element of the station such as their interval signal. For example, the “Lincolnshire Poacher” played the first two bars of the folk song “The Lincolnshire Poacher” before each string of numbers. “Magnetic Fields” plays music from French electronic musician Jean Michel Jarre before and after each set of numbers. The Gregorian solar calendar counts days as the basic unit of time, grouping them into years of 365+ and repeats completely every 146,097 days, which fills 400 years, and which also happens to be 20,871 seven-day weeks. Each “year” lasts exactly 365.2425 days, or 365 days, 5 hours, 49 minutes and 12 seconds. To compensate for this anomaly, the Gregorian year is divided into twelve arbitrary months of irregular length, with no regular relationship among their lengths. English speakers sometimes remember the number of days in each month of the Gregorian year by the use of the traditional mnemonic verse Thirty days hath September. A language-independent alternative used in many countries is to hold up the fists with the index knuckle of the left hand against the index knuckle of the right hand. Then, starting with January from the little knuckle of the left hand, count knuckle, space, knuckle, space through the months. A knuckle represents a month of 31 days, and a space represents a short month. 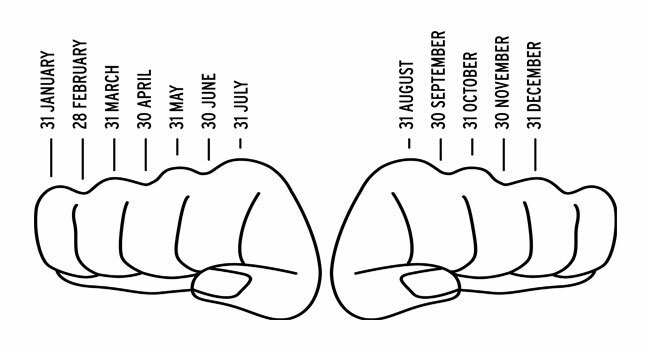 The junction between the hands is not counted, so the two index knuckles represent July and August. A similar mnemonic can be found on a piano keyboard: starting on the key F for January, moving up the keyboard in semitones, the black notes give the short months, the white notes the long ones. Cognitive space uses the analogy of location in two, three or higher dimensional space to describe and categorize thoughts, memories and ideas. Each individual has their own cognitive space, resulting in a unique categorization of ideas. The dimensions of this cognitive space depend on information, training and a person’s awareness. All this depends globally on the cultural setting. Many have tried to map in two or three dimensions various cognitive spaces. An attempt is made to place human perspectives within the global ecosystem and bridge real, ideal, and virtual spaces or realities along and across concrete scales. The concept is influenced by prior work with double augmented, merged and morphed realities. A cognitive space consists of at least two elements: the actors involved and the cognitive element. They share cognitive matter (shared views, symbols, common language use, common ways-to-do-things, etc.). Actors are included in numerous spaces simultaneously and during social interaction in one space, they can access cognitive matter from other inclusions. This enriches the cognitive element of a space and can give birth to new cognitive spaces. Cognitive spaces can be understood as workspaces of the mind. As such they are an elaboration on theories of social integration by enhancing concepts like social-cognitive configuration and multiple inclusion. A lexigram is a symbol that represents a word but is not necessarily indicative of the object referenced by the word. Lexigrams were notably used by the Georgia State University Language Research Center to communicate with chimpanzees. Researchers and primates were able to communicate with one another using lexigram boards made by up to three panels of a total 384 keys. Ernst von Glasersfeld coined the term lexigram in 1971, created the first 120 of them, and designed the grammar that regulated their combination. This artificial language was called Yerkish, in honor of Robert M. Yerkes, the founder of the laboratory within which the lexigrams were first used in 1973 by the chimpanzee Lana within the context of the LANA project. The term lexigram has also been used to describe a mystical property of words. A lexigrammer is one who composes lexigrams, decodes hidden messages in words, titles, names, terms, phrases or succinctly stated problems by putting together full, meaningful sentences using only letters found in those expressions. These messages convey a deeper meaning related to the subject of the original name, statement or expression. The act of lexigramming is considered a spiritual process. Associating the lexigram as a spiritual process was first done by Linda Goodman in her book Star Signs. She described several criteria which she believed were necessary for uncovering the spiritual meaning of a person’s name. While word-play lexigrams can reveal hidden codes or messages within a person’s name, the veracity of any spiritual value is subject to personal interpretation. Dreamworking differs from classical dream interpretation in that the aim of dreamwork is to explore the various images and emotions that a dream presents and evokes, while not attempting to come up with a single, unique dream meaning. In this way the dream remains “alive” whereas if it has been assigned a specific meaning, it is “finished”. Dreamworkers take the position that a dream may have a variety of meanings, depending on the levels that are being explored. A tenet of dreamwork is that each person has his or her own dream language. Any given place, person, object or symbol can differ in its meaning from dreamer to dreamer and also from time to time in the dreamer’s ongoing life situation. Thus someone helping a dreamer get closer to her or his dream through dreamwork adopts an attitude of “not knowing” as far as possible. In this way, dreamers are not obliged to agree with what is said and may use their own judgment in deciding which comments appear valid or provide insight. If the dreamwork is done in a group, there may well be several things that are said by participants that seem valid to the dreamer but it can also happen that nothing does. Appreciation of the validity or insightfulness of a comment from a dreamwork session can come later, sometimes days after the end of the session. A whistled language is a system of whistled communication which allows fluent whistlers to transmit and comprehend a potentially unlimited number of messages over long distances. Whistled languages are different in this respect from the restricted codes sometimes used by herders or animal trainers to transmit simple messages or instructions. Generally, whistled languages emulate the tones or vowel formants of a natural spoken language, as well as aspects of its intonation and prosody, so that trained listeners who speak that language can understand the encoded message. Whistled languages are normally found in locations with difficult mountainous terrain, slow or difficult communication, low population density and/or scattered settlements, and other isolating features such as shepherding and cultivation of hillsides. Thery have been more recently found in dense forests like the Amazon where they may replace spoken dialogues in the villages, while hunting or fishing to overcome the pressure of the acoustic environment. The main advantage of whistling speech is that it allows the speaker to cover much larger distances than ordinary speech, without the strain (and lesser range) of shouting. The long range of whistling is enhanced by the mountainous terrain found in areas where whistled languages are used. Many areas with such languages work hard to preserve their ancient traditions, in the face of rapidly advancing telecommunications systems in many areas. Whistled speech may be very central and highly valued in a culture. Shouting is very rare in Sochiapam, Oaxaca. Men in that culture are subject to being fined if they do not handle whistle-speech well enough to perform certain town jobs. They may whistle for fun in situations where spoken speech could easily be heard. In Sochiapam, Oaxaca, and other places in Mexico, and reportedly in West Africa as well, whistled speech is men’s language: although women may understand it, they do not use it. Though whistled languages are not secret codes or secret languages, they may be used for secretive communication among outsiders or others who do not know or understand the whistled language though they may understand its spoken origin.